We are off and running for the new year of CWA work! Materials and instructions were given out at each of the four regional meetings in the late fall. There are a few changes in our programs, burt we keep the basic things pretty much the same. Needlework Contest- The contest for the Northeastern area is the same as it has been. It was the State Director's choice not to make any changes. These entries go on to Eastern States for the regional contest. Printed pamphlets with the rules may be obtained from your Subordinate or Pomona chairperson or from the State Committee members. Just ask for them. 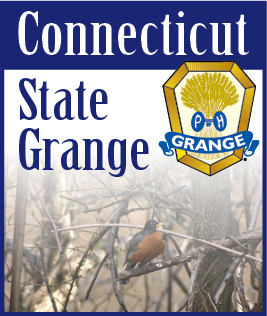 Judging for the state level will be held just ahead of "Let's Celebrate" day in July at Cheshire Grange Hall. We are working on some special features. We will also have a separate contest for a "Dress A Doll" category for the second year. Craft Contest- The entries for the craft contest are in keeping with the theme for the new year- "Catnip Capers." You may make anything that pertains to cats. Let's strive for creativity and be original. There are adult and youth categories in each of two classes - needlework or any other media. All entries come directly to the State judging and are retained by the State Committee to be used for the good of the Order. The Scrapbook Contest will be held for the third year. Entries are returned to the maker. Baking Contest - The recipe calls for pineapple, carrots, and raisins (yellow, orange and black). Does that give you a clue as to why we are calling them Calico Muffins? Really pretty! Really tasty! All CWA people have copies of the recipe. Give them a try- it can be a good practice run for your entry. In the months ahead Jean, Ruth, Anne and Jane of our committee will be writing this column with each of them giving details of one of the contests. Projects - Our projects will be donations to the Connecticut Granger Trust Fund, the Student Loan Fund and to the maintenance fund of Camp Berger. Covenant to Care- Get ready to send (with your delegates to State Session) items for babies (infants to toddlers). These may be things for little ones and can cover just about anything from bibs to blankets and beyond. Foster Families- Hope you will be as generous as you have always been with things for Foster Folks. We will be happy to receive the same kinds of items we have given to this group in the past. Each Grange may select the things we have done before or combination of things such as comfy covers, Christmas stockings, gift cards, toys, school supplies, etc. Eastern States - Each year you seem to give us handmade articles which help us to top the sales figures from the previous year in the Country Store. Can we do it again? Anything you make will be most welcome. You are a purr-fect group of great Grangers and we know this is a labor of love for many! Keep going and remember we still think you are the Cat's Meow!! !